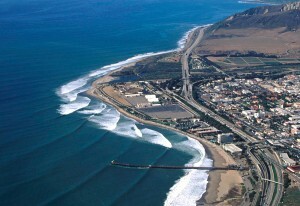 A key campaign success and ongoing project for the Surfrider Foundation Ventura County Chapter is the Surfers’ Point Managed Shoreline Retreat. 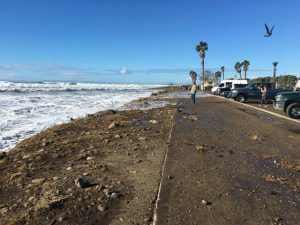 Instead of building a seawall or other coastal armor, which would have destroyed the beach and surf break, stakeholders came together and approved a plan to move the parking lot, pedestrian path, and bike path away from the tideline. Phase I of construction was completed in 2011. 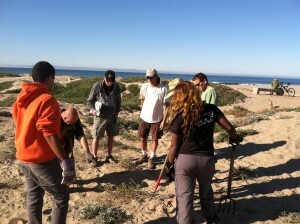 Since then, Surfrider volunteers have contributed to the resilience and beautification of the Point by planting and maintaining sand dunes and bioswales with native vegetation. The dunes and bioswales protect the beach and water from stormwater runoff, and protect the bike path and parking lot from the waves. While erosion damaged parts of the Ventura Promenade in winter of 2015, Surfers’ Point remained both attractive and functional. This project is designed to encompass all the factors that play a role at the Point: water (both fresh and salt), sand, stone, wind, vegetation, and human construction. Its goal is to meet the needs of recreation by bicyclists, beachgoers, fairgoers, and, of course, surfers, for many years, while simultaneously enhancing our local environment. Come storms and wind and sea level rise…with continued hard work and dedication, Surfers’ Point will remain. 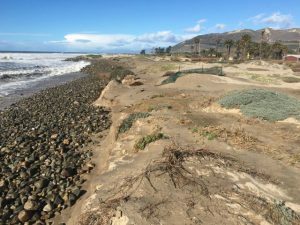 The next goal for Managed Retreat is Phase II of Surfers’ Point, which would protect the beach downcoast of the Point toward the Ventura Promenade.